We have already seen what waves are, that they can be simple or complex, periodic or not, and that they are the building blocks to work with sound synthesis. "Yes, OK, we got that," you'll say, "but where do they come from?" Well, these waveforms are produced by a specific element, which is crucial for almost any type of synthetic music production ─ the oscillator. Oscillator comes from Latin "oscillare," which means "to swing" or..."oscillate." An oscillator is a device whose nature is to be able to fluctuate between two extreme values around a point of equilibrium. 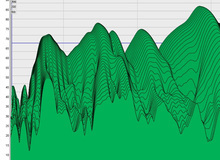 So it's perfect to create waveforms, one of whose main characteristics is precisely this modulation. For this purpose, we use VCOs (Voltage Controlled Oscillators), DCOs (Digitally Controlled Oscillators) and DOs (Digital Oscillators). 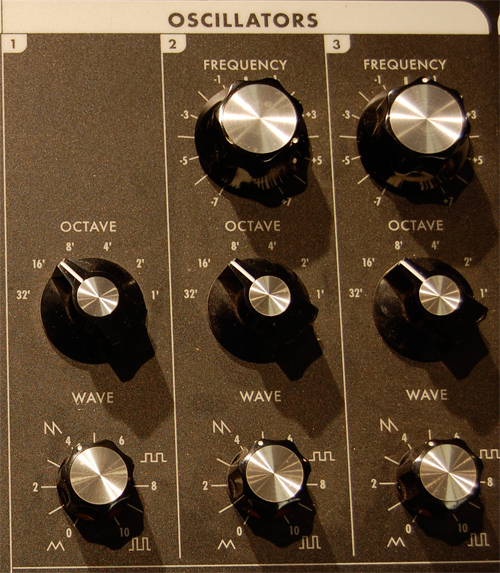 On synthesizers, these oscillators used as the basis for sound production can also be simply labeled "Osc." But there is also another type of oscillator used in digital synthesis that isn't used for sound production, it is universally called an LFO (Low Frequency Oscillator). Let's take a closer look at all this. As their name implies, VCOs are oscillators whose waveform, amplitude and frequency values are controlled by an electrical voltage. These values can be modulated with potentiometers. However, most times, the frequency (pitch note) and amplitude (the power of the signal) are modulated directly by the synth's keyboard. This, however, doesn't stop the oscillator section from frequently featuring a potentiometer labeled "pitch" or "detune" to tune the instrument. 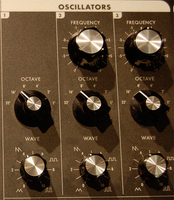 Some allow you to even shift octaves, like the Minimoog Voyager whose oscillator section you can see in the image on the left. For their part, DCOs aren't controlled by electrical voltage, but by digital values. However, the production of waveforms itself is still analog. So their sonic characteristics are very similar to those of a VCO. Analog oscillators aren't necessarily the most stable ─ some don't stay perfectly in pitch and/or need some time to warm up to reach a certain stability ─ nor the most "clean" ones. This, nevertheless, provides them a particular tone and a less-predictable sound than digital oscillators. The third category of audio oscillators, the DOs, is entirely digital. The main advantage of these oscillators in relation to VCOs and DCOs is their stability. They can be used in certain non-analog hardware synths ─ called "virtual analog" ─ or within software modules. In both cases, the goal is often to emulate the behavior of analog oscillators, with the intention of removing or controlling their defects, making them controllable at will. Yet another purpose of DOs could be to override the constraints inherent to traditional waveforms and the research of all-new sonic structures (like the grains we talked about in "Sound synthesis, sound design and audio processing - Part 4." The DO is also the most essential element of wavetable synthesis. We will talk about the latter in an upcoming article, but I can tell you this much in advance: It isn't based on the production of waveforms, but rather on audio samples (or recordings). In general terms, while the sound becomes more stable and clean, it can also be considered colder than that of analog oscillators. 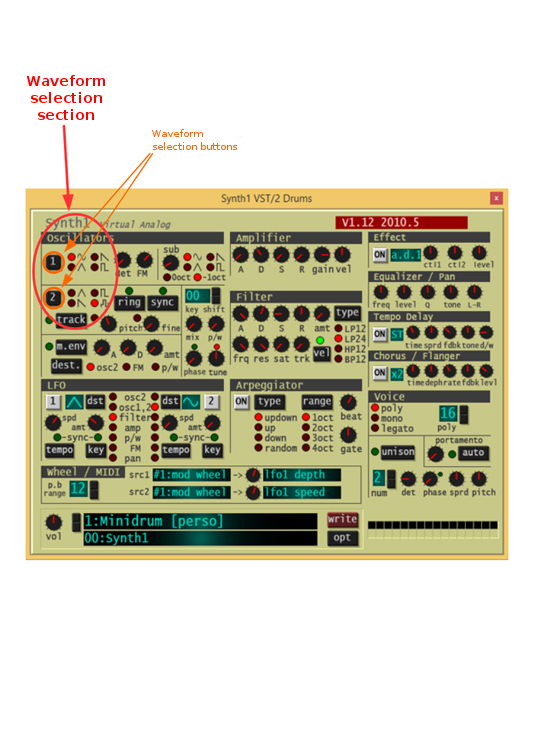 Synth 1, an example of a software synth that you can see in the image on the right, features entirely digital oscillators. By the way, if you still don't have a synth, I strongly recommend you this one to get started, since it has a very easy-to-learn structure (just way until you finish reading this series of articles and it will seem child's play!). LFOs are a very particular category of oscillators. Unlike other oscillator types, they produce frequencies below 20Hz, so they can't be heard by the human ear. But then, what good are they? Well, these oscillators aren't meant to create waveforms or play back samples, but to modulate an already existing signal. In fact, while you cannot hear the sound produced by an LFO, you can nevertheless clearly hear its effects on an audible signal.